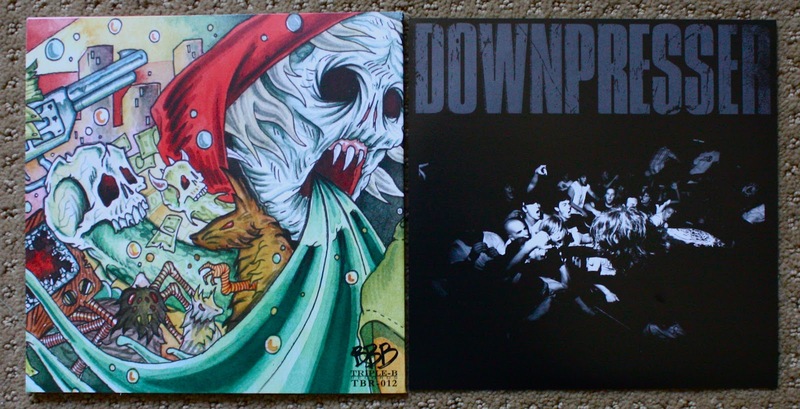 I really love this Downpresser 7". This was released on Triple B out of 300. 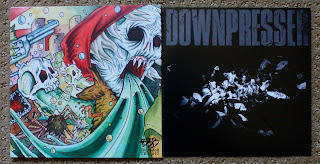 Downpresser is a pretty solid band. They aren't anything unique but thats okay. One thing that I've noticed about them is that they have really good lyrics. There vocalist has a good voice too, but there is one thing about this release that really drives me crazy... I can't stand when bands record the vocals on two separate tracks and then splice them together using pro tools. Yeah, alot of people probably can't tell and don't know what I'm talking about, but for anyone that has been in a band or a recording studio knows what I mean. If you are in Downpresser and reading this, PLEASE just record your vocals on one track, it will sound better and more natural and sometimes hearing the breathing whatever in the vocals just makes it sound harder. I love the artwork on this thing. Being called "Age of Ignorance" and the guy getting pummeled by... Ignorance rays? I'm not really sure but I see what they are getting at with it. The back is sick with the zombie ghoul thing vomiting, the spider, gun, smashed TV, nasty rat, its just awesome. This reminds me of the Trapped Under Ice and Dirty Money split that Spoiler did. I think this thing is OOP but if you see one on ebay it is definitely worth the pick up!